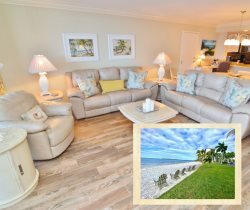 Our recent stay at Bay View #534 was fabulous, The recent redecorating made the condo an elegant and first-class retreat for our family. The beautiful artwork, furnishings, crown molding and the brightly painted environment made for a luxurious and comfortable vacation! Great style! Paradise! Very nice facility. Will stay again in the future. Great stay!! Love the lanai and open concept. There were a few things that needed repair but nothing we couldn't do without. Overall, we had an awesome stay and wouldn't hesitate booking a stay in the future"
We stayed in Bayview Tower 532. The unit was absolutely beautiful! I believe that it was recently renovated and professionally decorated. They did an outstanding job! If we ever come back to the area, we will definitely be staying there again! We had a fabulous stay! The condo and furnishings were top quality and the sunset views from the balcony were amazing. The pool, hot tub and beach area were just steps away and all very well kept (and the beach towels in the condo were much appreciated!). The only problem was that our time there was too short! Would definitely recommend and hope to return. I went to the office to ask a question and was met with kindness and helpful attitude by Angelo. Also went to the guest services to print out boarding passes and was greeted enthusiastically and they took care of my needs. The unit we stayed in was beautiful, clean, completely equipped and very comfortable. The grounds were very nice. We used the pool at the condo and the pool and restaurants at the Marriot. The only (slight) negative was the construction noise going on while we tried to enjoy quiet at the condo pool. We just moved over to the Marriot where it was more activity but not the noise of the power tools. We loved the location with easy access to Ft Myers Beach and Sanibel. The property is beautiful and the unit we stayed in was stunning! Very friendly, professional, knowledgable and welcoming! We loved it all! Our only suggestions are: (1) a mirror is needed in the spare room; (2)hooks, and towel bars are needed in the spare bathroom, and,(3) a new, unused pan scrubber should be left in the kitchen.